This artwork By Sarah Jane is a real eye catching painting where you can not help but stare back into the eyes of this nomad warrior. 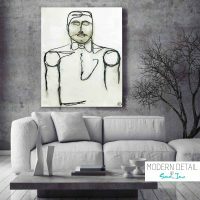 This is a contemporary painting on a square shaped canvas using very neutral colours with a grey and white background and the featured young man centre square where his facial features depict his culture. A hint of pale blue and apricot have been used to assist in showing the tribal nature of this man. The nomad will protect you. On display at Modern Detail By Sarah Jane. For more information about this painting including the inspiration behind it and a video, head to my blog.